I get emails every week from startups, apps, & companies wanting me to blog about their products to which I always (99%) nicely say "no thanks" and that my street cred and integrity on this blog is important! But when I fall in love with something that's fun and FREE - I just HAVE to share it! You have to try this in your life! 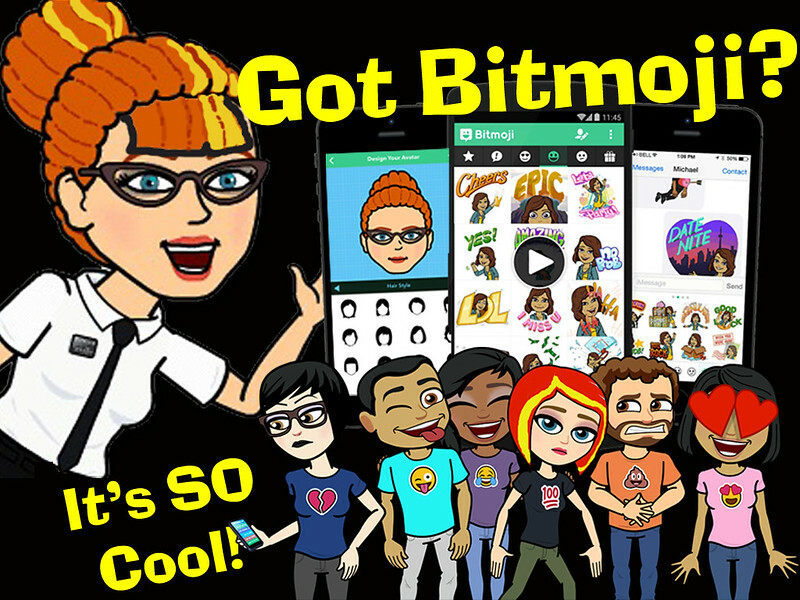 The Bitmoji app, brought to you by the people of Bitstrips (which I shared more than 4 years ago on my 21+ Avatar Generator & Creators page!) is available in both iOs and on Google Play for the Android OS. 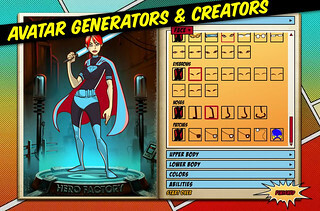 Create your face, bod, hairstyle, dress it up, & BOOM! They're put into these fun cartoon stickers that are an alternate emoji keyboard! Even my 75 year old Mom & Dad have them, and we use them with each other ALL the time. It's hilarious and a blast! I re-read this blog post early this morning and realized I used the word FUN....way too many times! they're NOT to use WITH the kiddos. Since some of the stickers or cartoons have to do with drinking alcohol (see Wine Time pic?) and some are sorta flirty, Not R rated, not even PG-13, but just not for kiddos IMHO! This is for your professional branding and fun. Once you download the app, you can easily create your face, choose your hairstyle (though they need a high pony tail w/ bangs or a pouf! --err hence my short avatar hair), hair color, body shape, & get dressed. You can change outfits later, they even have some designer and holiday or seasonal themed ones - but just be warned, some outfits become unavailable & you can't get back to them. I found that out the hard way. 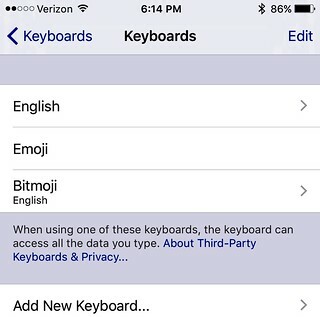 To use these Bitmjoji's you have to add them as an additional keyboard on general settings and make sure you select ALLOW FULL ACCESS, this way you can use them on your iPad's, too! 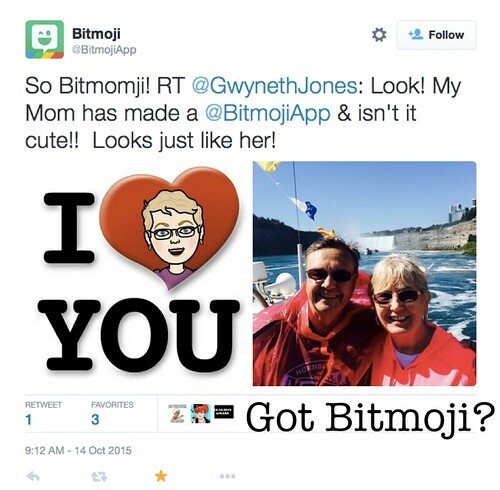 There are 6 categories of Bitmoji's, you select them by just touching, copying, and pasting into the message box. BAM! Done! To take them from the APP and into your computer, you can save them to your Camera Roll, then upload them to Flickr or email them to yourself, that way you can easily use them on Twitter and with other apps or edit them in Photoshop or PicMonkey like I did in the header above. I erased the background, made her a transparent PNG, and layered her onto the pictures of the phones. 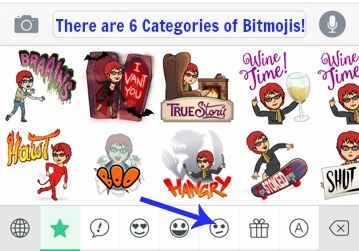 One of the cool features, is that when you change your avatar look, hair, or outfit, ALL the cartoon stickers automatically update. Just so you know, if you choose to wear a pair of glasses on your avatar -some cartoons will have sunglasses which means double glasses. (see below) I'm currently in LOVE with my new RL Coach frames and I had to wear them! 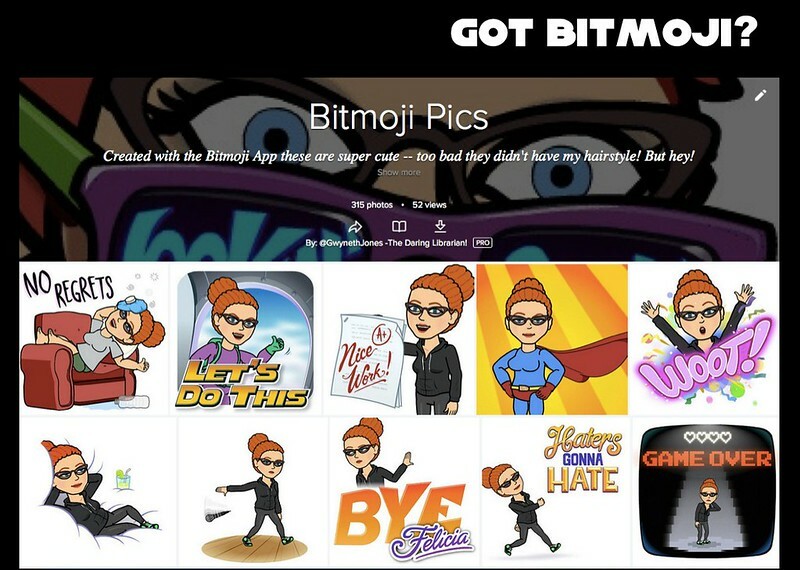 Here's a whole collection of Bitmoji's I saved in a Flickr album. 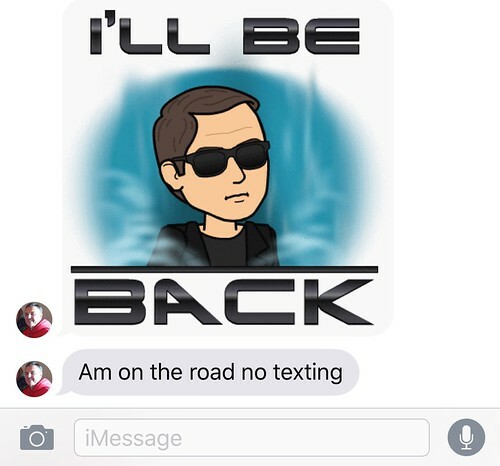 OK, Bitmoji - this one is FREE on me but if you're listening and feel compelled - I wouldn't be mad to get some swag to give away at my speaking engagements and maybe a hoodie? Heh heh heh. Shameless. Honestly, this is a fun way to brand your social media profiles! Cheers! All Thanks to Ms. Daniller! 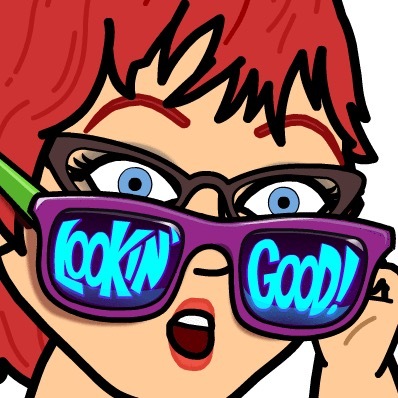 I did NOT discover Bitmoji myself, even though I've been sharing Bitstrips for years - it was shared with me by fellow ginger and a WONDERFUL MHMS Social Studies teacher and 6th Grade Team Leader, Ms. Daniller, who uses it for her Twitter profile pic and it looks JUST like her! She's pretty amazing! Thanks Ms. Daniller! You Rock! Please Be a Show Off! Secrets of the Remix Mash-up YouTube Generation Join me for FREE! Oh, and it's not too late to register for a FREE Learning Bird & School Library Journal Webinar with yours truly on Tuesday, 4pm Eastern! Here's all the webinar resources!